Oor Wullie Bucket Trail finishes! That’s it folks, the Oor Wullie Bucket Trail is over! The removal of the Oor Wullies began on Saturday, as the team behind the Trail lifted away the statues from their various locations around Dundee – all 55 of them! Hopefully many of you got the chance to see most of the Oor Wullies, but (like me) some might only now be realising their desire to adventure round the whole of the Bucket Trail. Never fear – the Wullies are off to be polished up before being displayed in two weeks at a special event in the centre of Dundee! From the 9th to the 11th of September, all of the Oor Wullies will be on display in the Slessor Gardens by the Waterfront. So you still have the chance to see them all one last time (without the hassle of walking/cycling/driving too far between them) and to take many a selfie with them before they are taken to be sold at auction. This was a project close to our hearts as it was celebrating one of Dundee’s most famous comics book heroes, and we were really happy to take part – we created (literally) our Wullie, aka Oor Elvis (above), which was designed by Cole Lawson, one of our Comics Clubbers, and painted by DCCS Coordinator Damon Herd. Keep an eye out for him if you attend the special event in two weeks! Not only did we design one of the Wullies, DCCS also got more involved in the project when our Coordinator Damon cycled around the whole Bucket Trail in one day! Starting at Carnoustie Golf Course and finishing up at Dr Manhattan outside Dundee University, Damon covered 35 miles in total on what turned out to be the hottest day of summer – no mean feat. We are all very proud of you Damon! You can learn more about this adventure by reading his Bucket Trail blog post. Overall The Bucket Trail has been a fantastic project, and no doubt the star attraction of Dundee this summer for both children and adults! I’ve really enjoyed getting to see lots of the Oor Wullies, and to experience the buzz that they have created in the city! Everyone at DCCS is very proud and happy that we got the chance to be a part of the Trail through Oor Elvis, and the legacy will live on as we are bringing him back to live in the Space – pop in and visit him anytime! DCCS Coordinator Damon and social media volunteer Caitlin meet Oor Wullie as Dr Manhattan. Posted on August 29, 2016 August 29, 2016 by dundeecomicscsPosted in elvis, oor wullieTagged bucket trail, comics, damon herd, dccs, elvis, oor wullie, slessor gardens. Here is the final profile we have for you this week – some (Damon) may say we have saved the best for last. Introducing DCCS Coordinator, Damon Herd! I’m Damon Herd, I’m 45 and I’m from Fife. I’m coordinator of DCCS, so that means I have day to day responsibilities for running the space – liaising with outside organisations and partners, programming workshops for our after school clubs, and arranging artists and facilitators for our studio space. I’ve always been interested in comics, as a kid I used to draw my own Danger Mouse comics with a school friend. I would go to the local library and pour over Asterix and Tintin books. Like Phil, I also used to get Rupert the Bear books at Christmas – I think that places us in a certain age group! I had my first published drawing in issue 26 The Nutty – a comic from DC Thomson – at the age of 9. When I left school I worked as a draughtsman, when you still drew with pen on boards, and then fell into Civil Engineering. It was never really what I wanted to do though, so I eventually ended up working in a record shop in London, and then got a job in the film and TV industry. That lasted until my mid-life crisis when I went back to art school in my thirties. I studied Book Arts and then later did an MA in Illustration at Edinburgh College of Art. When that finished, I was accepted to do a PhD on comics at DJCAD. It was titled Truth Games: Fact, Fiction and Performance in Autobiographical Comics and I just handed it in a couple of months ago. As my PhD was coming to an end, the job at DCCS came up so I applied. And here I am! I’m a practising artist, I like working in screenprint and I’ve made installations and murals in the past. I also make my own comics such as The Adventures of Ticking Boy. During my PhD I conceived DeeCAP (Dundee Comics Art Performance), which is a theatrical event where we project comics on to a screen and the authors recreate or perform their comics. I also like to ride my bike – I recently combined my love of comics and cycling by doing the whole of the Oor Wullie Bucket Trail in one day on my bike! I’m also one of the regular posters at comics blog Graphixia which has a roster of comics academics, mainly from Canada and Europe, blogging on all things comics. Love and Rockets is probably my all time number one favourite comic, especially the stories by Jaime Hernandez. It began in the early 80s as a slightly sci-fi inflected tale of punk living in LA, but it slowly lost the sci-fi trappings and focused on the characters, who have grown older as the comic has continued over the last 30 years. I love Jaime’s black and white drawing style, he is an artist who really knows how to use black on a page. Another favourite would be Susceptible by Geneviève Castrée, her work is really delicate and beautiful and personal, but sadly she died this year. Like Norrie, I agree that the best Batman book is Batman Year One. It’s a great combination of Frank Miller’s writing, David Mazzucchelli’s art and Richmond Lewis’s colouring. Just seeing what the kids come up with during our workshops – they are endlessly inventive, some of them are really natural instinctive cartoonists and their work is always surprising. Usually there’s a good fart joke. It’s great working with artists day to day and it’s also given me the opportunity to continue creating my own work. Everything about the Space is great! (I think he also enjoys bossing around interns.) What are you working on at the moment? The after school clubs have been a bit quiet over the holidays but now the schools are back hopefully it will get busy again. We’re working towards getting our Comics Clubbers to produce comics so we can sell them at the Ex Libris book fair at the Dundee Literary festival in October. In a personal capacity, I’m currently guest editing the next issue of Scottish literary journal The Drouth. It’s a comics special and it’s given me great pleasure selecting artists and writers to produce strips and articles for the issue. It should be out in October and it’s going to be great! Posted on August 19, 2016 August 19, 2016 by dundeecomicscsPosted in interviewsTagged comics, damon herd, dccs, dundee, interview, profile, tickingboy. Then come down to Dundee Comics Creative Space this Friday (or ask a parent or guardian to bring you!) for a chance to find out what we are planning here at DCCS! The first 10 young people through the door on Friday will receive a free copy of the first issue of How to Draw the Marvel Way. *Our project is aimed at 10-17 year olds but everyone is welcome to attend the open day. 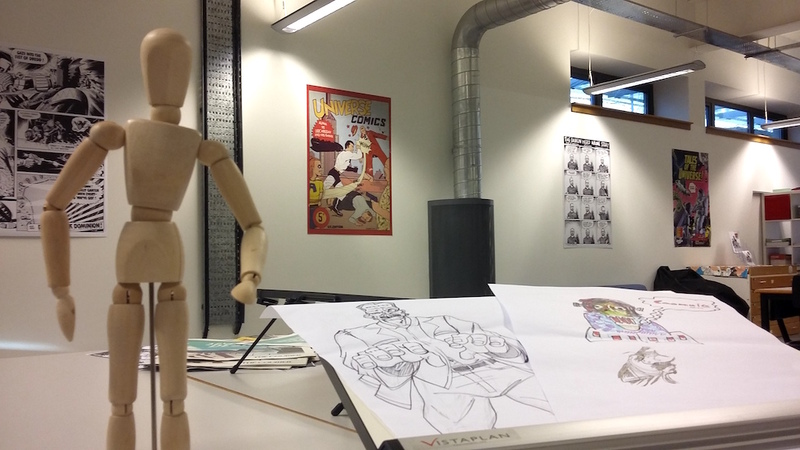 Ahead of our launch in a couple of weeks this is a chance to visit Dundee Comics Creative Space and see what we are up to! Drop in to see the space and meet the comics creators who are usually hard at work making comics in our studio. You can also sign up for our three workshops. They are FREE but booking is required at the links below. Please note that DCCS has no allocated parking at the Vision Building. There is public parking available on Greenmarket and Perth Road. The most convenient access point for DCCS is the entrance on Seabraes Lane off Perth Road. Posted on February 10, 2016 February 11, 2016 by dundeecomicscsPosted in Events, workshopsTagged comics, dccs, dundee, open day, workshops. In a few days time we will be launching a short comic strip to introduce DCCS. It will also contain a news announcement that we are very excited about! In the meantime here is a taster image from the strip – a comics selfie featuring DCCS Co-ordinator Damon Herd with some other guy in a stripey top. Posted on November 10, 2015 by dundeecomicscsPosted in DCCSTagged comics, dccs, dundee.